The body of a trainee nun who was allegedly crucified in an exorcism at a monastery in eastern Romania has been exhumed, the state news agency reports. Irina Cornici, 23, died in June after being tied to a cross and starved. 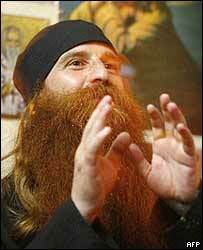 Principal monk Daniel Petru Corogeanu, who said the novice was possessed by the devil, has been charged with murder and illegal confinement. He, and four nuns also charged, had asked for an autopsy on the exhumed body in a bid to prove their innocence. A first autopsy concluded the nun died due to dehydration, exhaustion and lack of oxygen, state news agency Rompres reported at the time. The agency quoted defence lawyer Maria Ilisei as saying that they hoped a second autopsy would uncover "the real causes of the death". "It will be a complex affair to provide all the answers that remained unanswered from the first examination." Prosecutors and forensic doctors arrived at the village of Perieni where Ms Cornici is buried on Wednesday morning, Rompres reported. Her parents had prayed at the graveside before the exhumation began. "It is good that they exhumed her, maybe this way the truth will come out and those who killed her will pay," her father, Costica Antohi, was quoted by Rompres as saying. 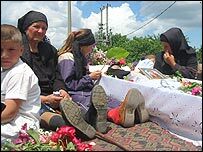 Irina Cornici, who grew up in an orphanage, is said to have arrived at the remote Holy Trinity monastery in Tanacu three months before her death. She was reported to suffer from schizophrenia. It is thought the symptoms of her condition may have led the priest and four nuns to believe she was possessed by the devil and the crucifixion was part of an exorcism ritual. Another novice from the monastery, Iustina Galca, told the BBC that the nuns had not even given Ms Cornici water during her ordeal. When asked if the nuns had tried to protest against the woman's treatment, she said they had all obeyed the priest. The Orthodox Church condemned the incident as "abominable", banned Father Daniel from the priesthood and excluded the four nuns from the church. The five accused, who deny murder, are on bail pending trial. They could face 20 years in jail if found guilty.